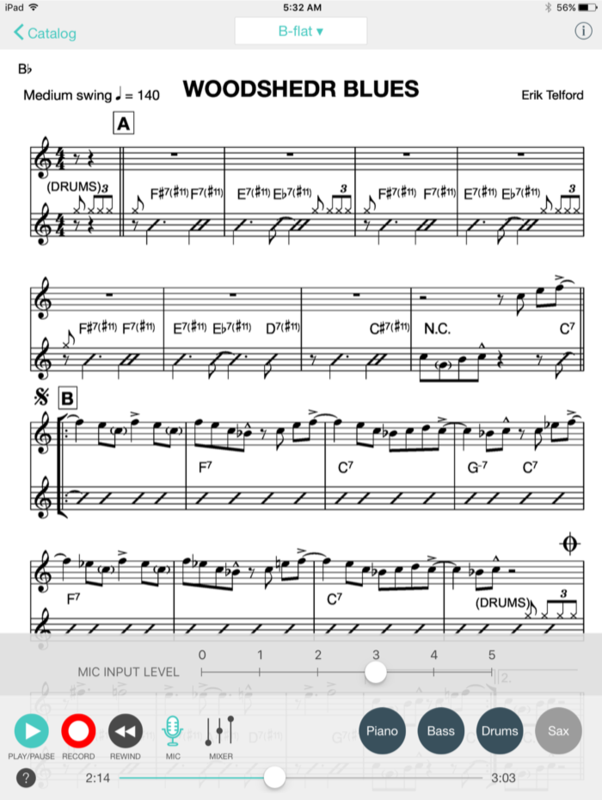 An iPad & iPhone app for learning how to improvise to your favorite tunes with real musicians. You’ll be shedding with real music played by top-call musicians. It’s the next best thing to being in the band. Choose the instruments to play along with. Mute the drums? No problem. Comp behind the soloist? Sure. Go for it. Capture your performances and hear progress over time. Tape don’t lie. Set your default key and mixer settings. Do it once and Woodshedr’s got your back. Share your performances via Dropbox, SoundCloud, email, and more. Preview & purchase tunes from right in the app. The Woodshedr catalog is updated on the regular. Give students an engaging way to practice. Listen to their recordings & pinpoint strengths and weaknesses. Don’t worry about turning pages. Woodshedr scrolls the chart as the song plays. Buy it today on the App Store and start shedding!